"A Novel of Two Americas"
When Rosa's mother loses her job with the Corporate United States of America, her family must flee or be killed in an employee purge. Taking the dangerous bus trip across the Unincorporated States, they are ambushed by bandits. Hopelessly separated from her family, Rosa is rescued by the people of Ascension, a small backwoods Virgilna town with a terrible secret. Motherless Child has not been tagged yet. Help others find Motherless Child by tagging it! 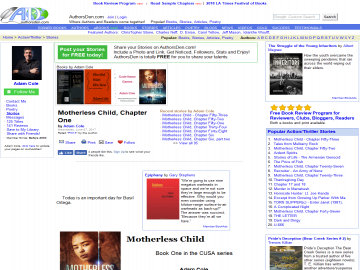 Motherless Child has not been reviewed yet. Motherless Child has not been recommended yet.